Kellie and Steve were facing the living room. There were people in the room behind, or next to, the photographer. 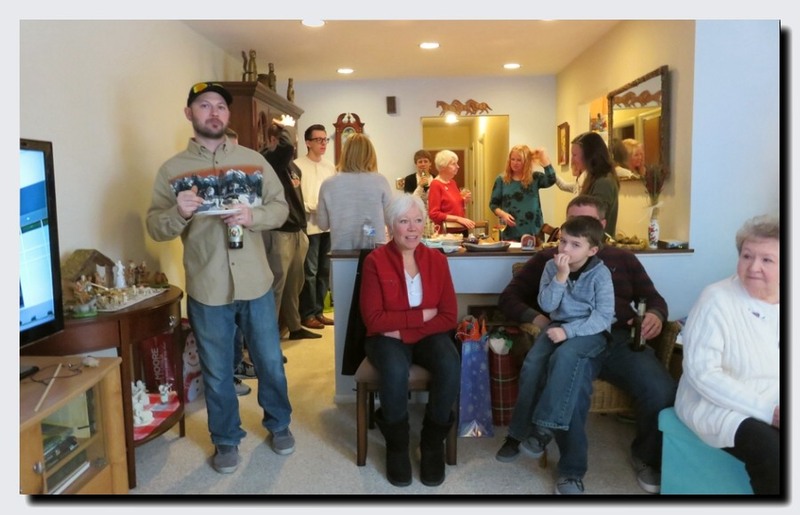 This picture, taken on December 31, 2017, shows Cindi standing in the living room. She's in approximately the same location she was in when she took the "mystery" picture. At the time, the door was open and the setting sun was shining in through the window and the door. 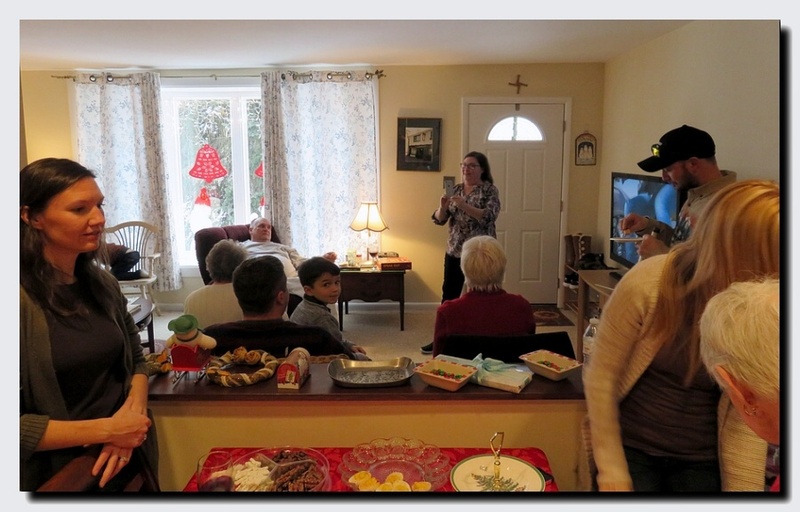 The shadows on the dining room wall are of people in the living room. A wider view of the room. No mystery shadows on the wall here because it was cloudy outside. 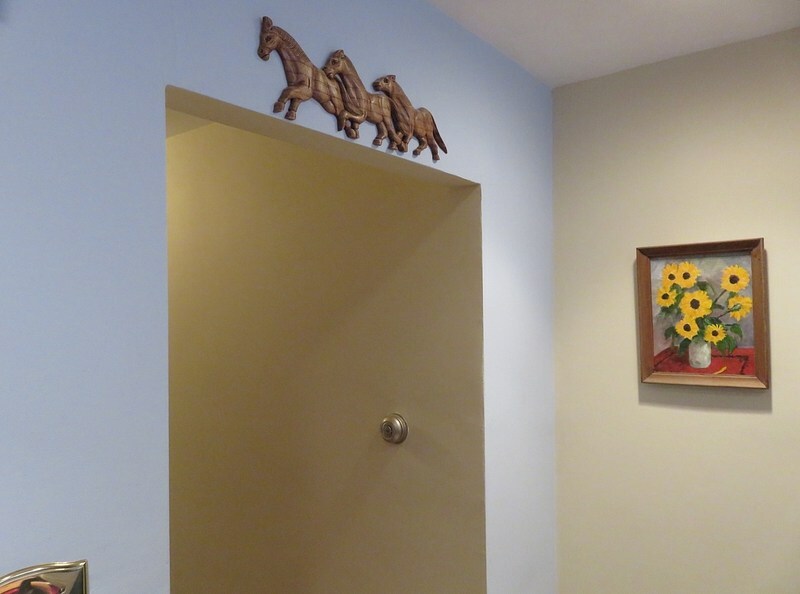 The horses over the doorway. Uncle Tom painted the sunflowers. Under the painting is another painting of a safe. Under the painting of the safe is a painting of an open safe, and in the safe is the "mystery photo." The "horses" carving is in reality a three headed, 12 legged "equine centipede" that Cindi ran over with her car. You can still see the tire tracks. She let it dry in the sun till the smell went away, then smushed it onto the wall above the doorway. The neighborhood is infested with these equine centipedes and the smushed one scares the others away from the bedrooms during the night. The round thing on the wall is a door knob. It opens a door to another dimension, a dimension not only of sight and sound but of mind. A journey into a wondrous land whose boundaries are that of imagination.